This is our fourth tag and one we have been wanting to make as we love Vintage posters (especially Art Deco era Railway posters)! We live quite near to Cambridge - the city in England about 60 miles north of London, well-loved for its famous university, historic buildings and 'punting on the River Cam'. 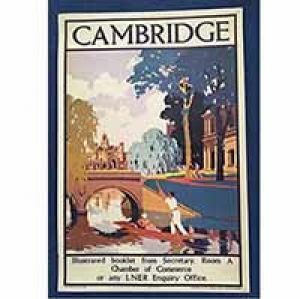 This tag is based on a Vintage Railway poster of the LNER (London & North Eastern Railway) dating from c. 1930, and shows the world famous King's College Chapel and punting on the river Cam. We hope you like it! We love collecting Vintage Posters, Charley Harper designs, Cats, Landscape or Building designs which are particular places, JMC, Nature/Animals and Silhouette designs. We would love to trade for Vintage Poster designs, but will always consider any of these on our list.